bonjour monday. bonjour week of comp exams (that i've been nervous about for 8 months). bonjour sunshine. bonjour final days of internship and spring semester. bonjour upcoming teaching in montreal + return trip to oklahoma. bonjour securing final deets on paris + provence art + yoga retreat. 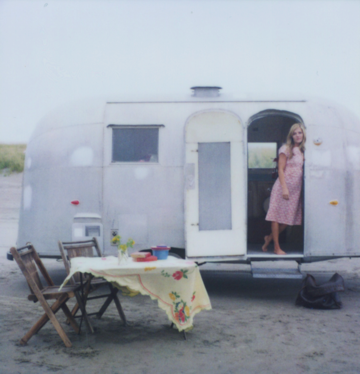 bonjour dream of buying a vintage airstream like the image above. my shoulders are feeling lighter and my heart is feeling open despite my head being in the sand about the need to study, study, study for friday's exam. somehow knowing that dreams are in the works helps the heaviness feel less, well, heavy. after launching two collections, taking 5 classes, interning 16 hours a week, and overseeing my babies continuously (aka businesses + non-profit) for the past 8 months, i'm beginning to feel a shift in spirit as the semester winds down. 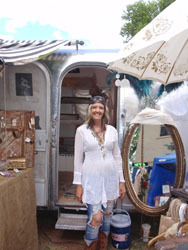 last week's post and this weekend's play (saw bill cunningham new york, found the perf villa in provence, researched vintage airstreams, browsed magazines, pondered living in provence for a month, dreamed of betsey johnson's apartment) helped crystallize what we all already know. dreaming. is. important. 5. look for ways to fulfill the desires. art journal. collage. plan. look online for ideas. sometimes we need a dash of dreaming sprinkled into our continuous doing. try it. your spirit will thank you. and spring is the perfect time. Best wishes on your comps! I know you will do great! I am printing out a copy of this post to to carry with me. I will look at it every time I am cranky. Thank you for this! Love the post. And I see your going to be in Montreal - it's a close trip for me so I will have to look into going for the day!